More than twenty years ago, Julia’s 5 year old son Jens went missing and was never found. They were on holiday visiting her parents. She doesn’t know what happened to him, and is now depressed, living on sickness benefits and drinking too much wine. Then her father, Gerlof, rings for the first time in nearly a year, to tell her someone has sent him Jens’ sandal. This prompts Julia and Gerlof to start trying to find out what really happened all those years ago, in the hope that, if nothing else, they can move on. A lot of evidence points to Nils Kant, who was known to be an unpleasant, sadistic man, and the story of the present day investigation is interspersed with flashbacks to his life from childhood. I’m not sure about some of the flashbacks, as we don’t learn so much about what makes him bad, we just get lots of examples of it. There is also contradictory evidence though, which casts some doubt that Nils Kant killed Jens. I am a bit wary of missing children stories, but I was curious about a new to me Swedish writer and this sounded interesting enough to overcome my prejudice. The novel is quite long at 480 pages and seemed quite slow paced at first, but gradually I was drawn into the story. Both Julia and her dad were quite remote characters and felt difficult to get to know, but gradually they began to seem more real and engaged my sympathy. Julia also gets help and support from a local policeman and she and Lennart become increasingly attracted to each other. The setting of Echoes from the Dead is interesting – Oland is a real island, popular with Swedes as a holiday place, but very harsh and cold in the winter, and this inhospitable weather becomes part of the plot. Theorin himself spent summers there from childhood, and has now set 4 novels there. Echoes from the Dead has been referred to as the first book in a series, but it reads more like a standalone. I wonder if they’re linked by their common setting on Oland rather than recurring characters? Finally, once I got into the book, the many twists and turns of the plot kept me turning the pages. 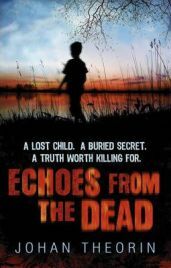 Echoes from the Dead is an atmospheric debut and I will certainly be looking for Johan Theorin’s other novels. Thank you to Transworld for sending me this book to review as part of their Great Crime Caper challenge. One Comment on "Echoes from the Dead"
Nice review! I read this book too (http://leeswammes.wordpress.com/2011/03/13/book-review-echoes-from-the-dead-by-johan-theorin/) and enjoyed it a lot. I also found that Julia and her father were a bit distant to me, but I started to like them better as the story unfolded. And it certainly was very atmospheric!